There's a masterpiece quietly nestled behind the lush desert foliage of Clearwater Hills, hidden from sight were it not for a pointed roof peeking out from the canopy of trees. Chances are, few people have ever seen this little gem, designed by architect DK (Donald Keith) Taylor in 1960 for himself and his wife Nellie. 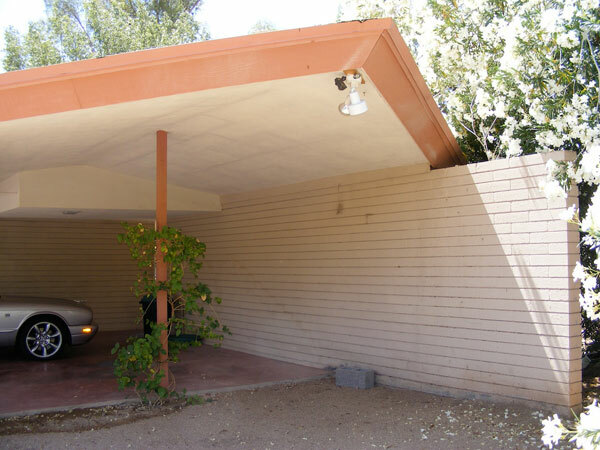 Not unlike this house, Modern Phoenix has had only glimpses into the life and works of this obscure but important architect. Other than his home in Clearwater Hills, we know of only one other Taylor-designed house in the Valley -- and its not just good, its remarkable! To understand Taylor's two known works, it's important to discuss the major influences on the architecture of Scottsdale after World War II. As early as during the Great Depression, wealthy visitors would come to Scottsdale viewing it as a charming western getaway. In an effort to cash in on this allure, the Chamber of Commerce proclaimed Scottsdale as “the West's most Western town” in 1947. Unfortunately, this western identity was often expressed literally and led to a downtown that looked like a Hollywood frontier movie set. Another factor that shaped the post-WWII architecture of Scottsdale was the town's reputation as an artists' haven. As early as 1929, artists and architects began to flock to this southwestern destination. The most important, of course, was Frank Lloyd Wright who purchased land in Scottsdale in 1937 for what would eventually become his winter home, Taliesin West. 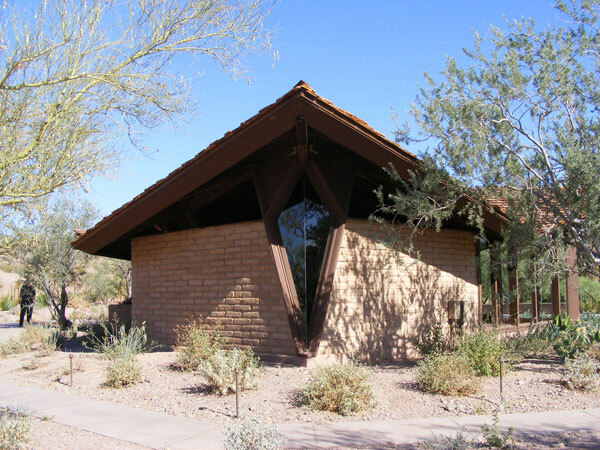 The presence of Wright and later the Taliesin West School of Architecture created a strong modern influence in Arizona. 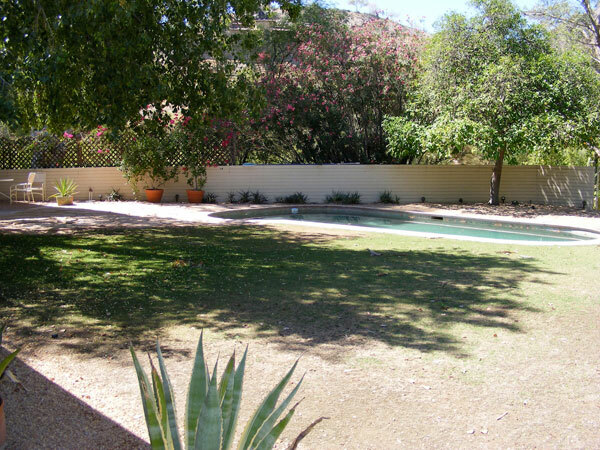 After WWII, Scottsdale began to grow by leaps and bounds becoming a major tourist destination. As the art and architecture of the city became more sophisticated, the literal frontier style slowly faded and a more abstract expression of the West took hold. 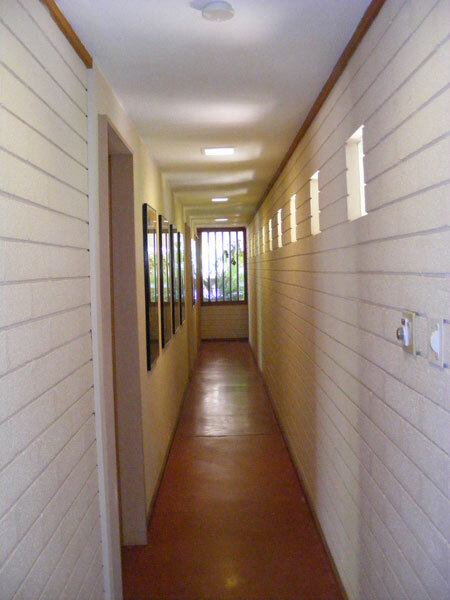 Taylor entered the Valley architecture scene in 1956, where his first known place of business was in Studio 8 of the Kiva Crafts Center located on 5th Avenue and Craftsman Road in downtown Scottsdale. He was one of the original tenants of what was then a brand new arts complex in the heart of the city. The Kiva Crafts Center embodied not only the modern movement of the time, built, as it is, in the minimalist modern style, but also Scottsdale's thriving artisan culture. As a tenant, Taylor was surrounded by various artisans working in glass, clay, leather, textiles and other media. Lloyd Kiva New, a champion of the Indian Arts in Scottsdale, was associated with the complex and the center became known as ‘the Indian village'. The dual influence of modernism and the artisan sensibility so pervasive at the Kiva Crafts Center was soon to become evident in Taylor's work as well. 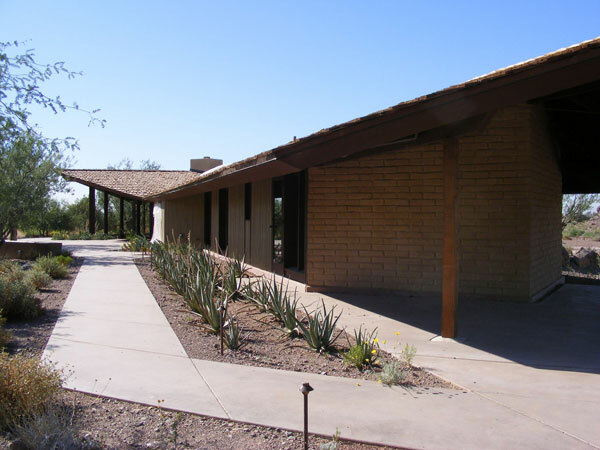 In 1957, one year after the Kiva Crafts Center opened, John and Sandra Day O'Connor had bought land in Paradise Valley and were seeking an architect. According to their son Scott, they found Taylor at ‘the Indian Village' and hired him because he was ‘Taliesin-trained and wasn't going to charge an arm and a leg'. In fact, Taylor was not Taliesin-trained according to the staff at both Taliesin and Taliesin West. There is no record of him at either school. 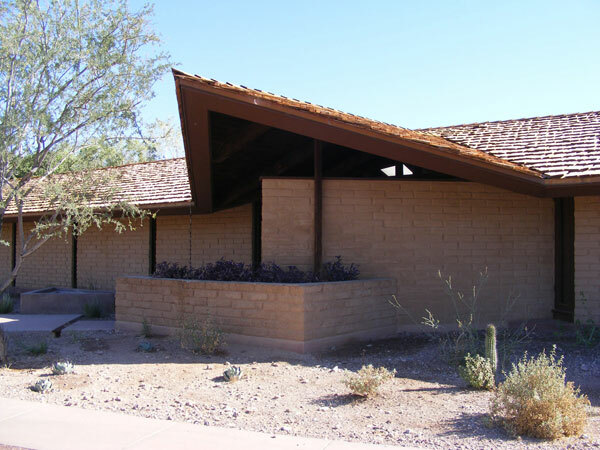 But looking at his work, it's clear that he (along with many other Scottsdale architects of the time) was most definitely influenced by Wright.The O'Connors found Taylor appealing because he was a modernist willing to work with a traditional, hand-crafted material: the adobe brick. 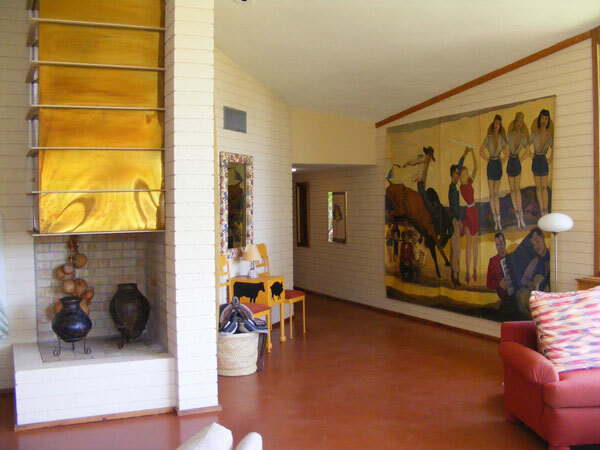 This combination of modernism with a traditional western component (so traditional, in fact, that the Native Americans used it before the Spaniards arrived) was the quintessential Scottsdale style of the time. Taylor's professional relationship with the O'Connors proved to be pivotal for his legacy. Because of its famous owner, the home Taylor designed in 1958 has been saved from lonely anonymity, or worse, hapless demolition. Thankfully, it's been preserved and moved by the Rio Salado Foundation for O'Connor House to it's new home just south of the Historical Society Museum in Papago Park. Plans for its ultimate use are still in the making, but we suspect the building will be appreciated and preserved for long time to come. Though the main reason for the preservation of the house is in honor of Justice O'Connor's time in Arizona, Taylor's design work is quite extraordinary, worthy of preservation in its own right. Taylor was a master modernist. The composition of the home is simple but exquisite. It sits on a strong north-south axis. Taylor uses the roof expressively and artistically; a single low-pitched roof creates an extended horizontal line with a deep overhang on the south side. In two instances Taylor flares the roof upward: once to indicate the entrance on the east side and again to open up views of Camelback Mountain on the west side. Another modern feature of the house is the open living, dining and kitchen area. The O'Connors spent many hours entertaining friends in their home and the open floor plan allowed the future Justice to be in the kitchen while interacting with her guests in the living room. This layout was very progressive for the time as contemporary homes typically hid the kitchen out of sight from shared living spaces. Taylor used a minimal palette of materials that gives the home both a modern and a Southwestern sensibility. Nowhere is this more apparent than with the free-standing adobe fireplace. Its location, in the middle of an open-plan living room, is very modern, but the adobe brick gives it the look of a traditional hearth. 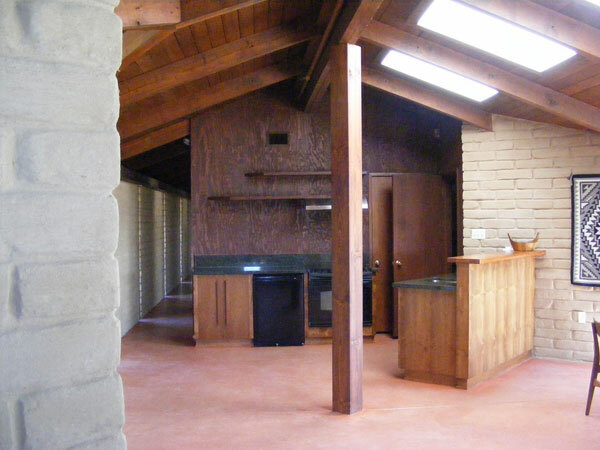 Throughout the house, the adobe brick is exposed, and along with the wood structure and red concrete floors, it gives the home a rugged feel. In the end, Taylor elegantly achieved what Justice O'Connor had asked for which was to recreate the memories of her childhood adobe home on a ranch in Duncan, Arizona. 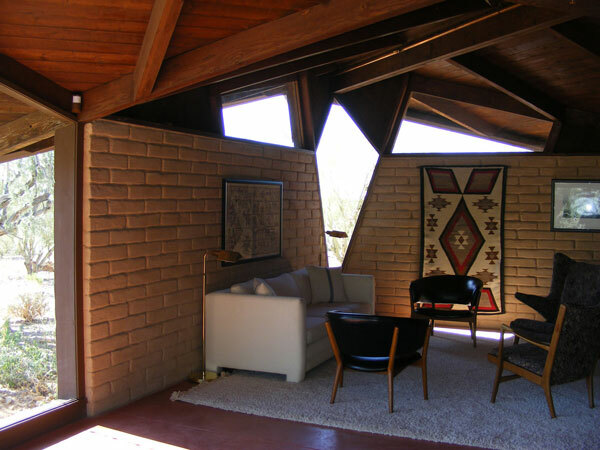 One striking feature of the O'Connor house is the diamond-shaped window on the north end in the living room. This unusual shape could be an architectural abstraction of the Indian Arts that surrounded Taylor at the Kiva Crafts Center. 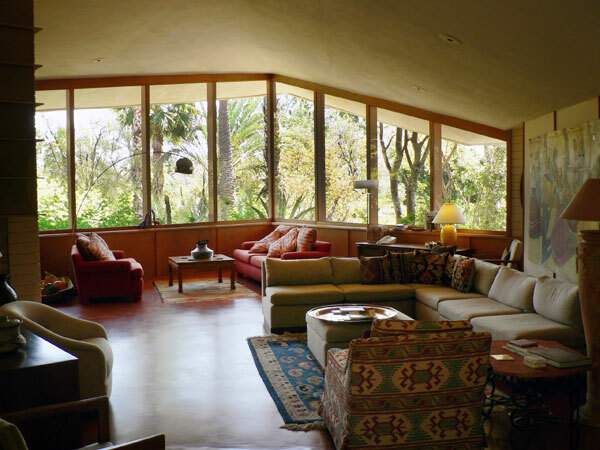 Regardless of its origins, though, this window gives the home an unmistakably Southwestern flavor. 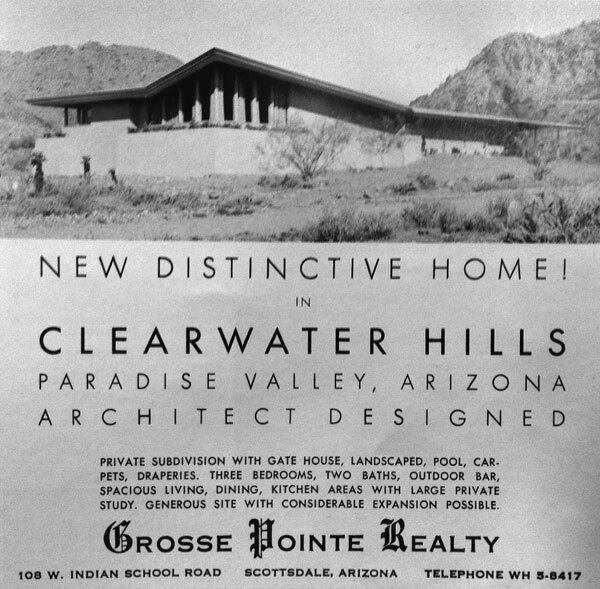 After designing the O'Connor home, Taylor bought a desirable corner lot in Paradise Valley's prestigious Clearwater Hills neighborhood, intending to build a home for himself and his wife in 1959. This home, as mysterious as it is beautiful, sat quietly for almost 23 years without a resident. According to tax and county records, Taylor was unable to pay his contractor, Robert Boddiger, for the work he did, resulting in several liens placed against the property. For reasons unknown, Taylor was not even able to pay the mortgage and the house went into foreclosure. Unfortunately, the Taylors were never able to live in the home. The bank took possession of it shortly after it was finished in 1961, and held on to it until 1984, when Florence Mahoney bought it from the bank. We don't know what happened to it in the 23 years before it was sold to Mahoney; it may very well have sat vacant the entire time. It's still in remarkably good condition, though, indicating that the bank must have maintained it well. Although Mahoney never actually lived in the house, she acted as the home's guardian angel. She was a well-connected community activist, a mover and shaker on the local and national scene in the field of biomedical research, and a preservationist who recognized how special this house was. She bought it from the bank and rented it out to a Paul Glenn. He eventually bought the place from her, but sold it in 1995 when he moved to California. Mahony insisted that he sell it back to her, knowing that in the wrong hands it might get demolished. She had some minor repair work done and put it up for sale. Mahoney received many offers but hand-selected the next owners, Kathy Fitzhugh and John Martin who bought it in 1995 and have used it as a winter home ever since. This home has a more modern look than the O'Connor house. Here, Taylor used horizontally-scored 4-inch concrete masonry block instead of adobe brick. The horizontal scoring emphasizes the low-slung profile reminiscent of Wright (and also evident in the O'Connor house). And like the O'Connor house, Taylor uses the roof expertly to mark important spaces and to capture views of the desert. He does so beautifully in the living room, creating a grand church-like space, allowing the residents and guest to visually drink in the natural desert landscape. The fireplace is once again significant in this house, a true work of art. It's adorned with horizontal fins repeated in a perfect rhythm that recalls similar details by Wright. The copper used for the smoke chamber is a delightful accent material amidst an otherwise minimalist palette of concrete, wood, masonry and glass. 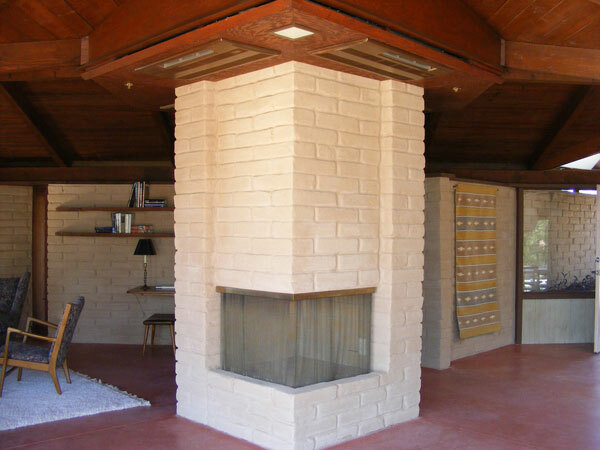 The copper fireplace on the left blends well with the horizontal lines of the masonry. The whimsical WPA-Style artwork is by Californian artist George Spangenberg, a seven-fingered, alcoholic and colorblind artist who paid his bar tabs with paintings. These paintings appear to have been salvaged from an architectural interior mural, showing quaint scenes of California ranch life. In one of the few updates Mahoney made to the house, architect Wilson Jones added light to the narrow corridor leading back to the bedrooms. Jones punched small openings in a pleasing rhythm along the wall that not only brighten the corridor but add a dynamic flair on both the interior and exterior of the wall. One big difference between the O'Connor and the Clearwater Hills houses is in the way they are sited. The O'Connor home is narrow and straight, constrained on both sides by desert washes. The Clearwater Hills home, on the other hand, is much more relaxed in its siting, spreading out boldly on the lot. For example, Taylor extended his horizontally-scored walls beyond the already-ample carport in an effort to spread the wings of the house even further. In the back, he added a pool with plenty of space around it and extended a short site wall that makes the home seem larger than its 2500sf. Sadly, not too long after the financial troubles with the Clearwater Hills house, Taylor mysteriously disappeared from the Valley. There are no records showing that he was living or working here after 1963. So complete was his disappearance that even after extensive research, we aren't certain if he is still living today and if not, where and when he died. Fitzhugh and Martin have recently put the Clearwater Hills house up for sale. Considering that the home has remained intact and in good condition for fifty years (despite being unoccupied for nearly half that time) and thanks to guardian angels like Florence Mahoney, it's imperative that it not fall into the wrong hands now.John Oliver, the property's real estate agent, immediately recognized how special the house is and contacted Modern Phoenix to work the underground network of preservationists. He tells us that 2500sf is small by Clearwater Hills standards which means that someone might see it as an opportunity to tear the house down and use the valuable corner lot to build a large mansion. 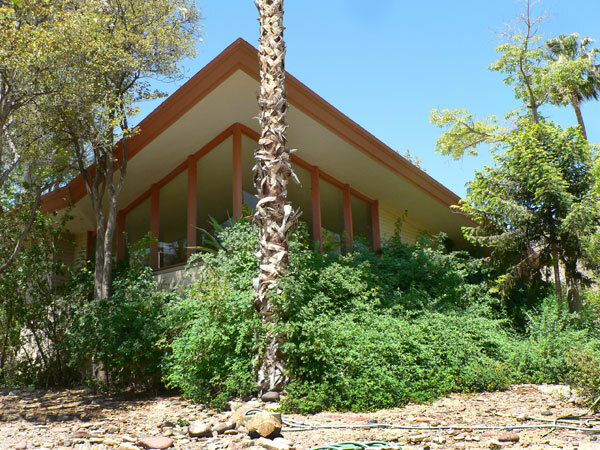 This would be tragic, not only because the house is a modest architectural masterpiece, but because it's one of the few remaining works of the mysterious and brilliant DK Taylor, an architect who made an important contribution to mid-century modern architecture in the Paradise Valley area. Postscript: The DK Taylor home was purchased and saved shortly before the publication of this article, due to networking eforts in the Modern Phoenix community. 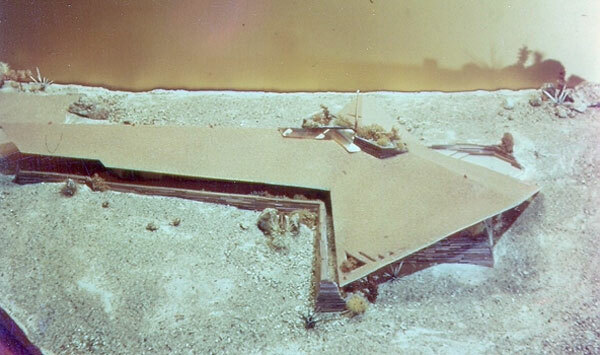 Scale model of the O'Connor house by architect Lamont Langworthy for D.K. Taylor. Used with kind permission. Taz Loomans is a LEED accredited professional and a licensed architect. She owns Blooming Rock Development, focusing on redeveloping sustainable and affordable housing in Central Phoenix. She also writes the Blooming Rock blog which explores green building, urban development and architecture in Phoenix.